Good Friday, April 6, 1917 was also Passover Eve. The Jews of Jerusalem were destitute. Money from foreign Jewish communities had been cut off because of the war. Breadwinners were absent, many forcibly conscripted into the Turkish army or hiding from the army. But Jewish families did their best to prepare for the Passover holiday. 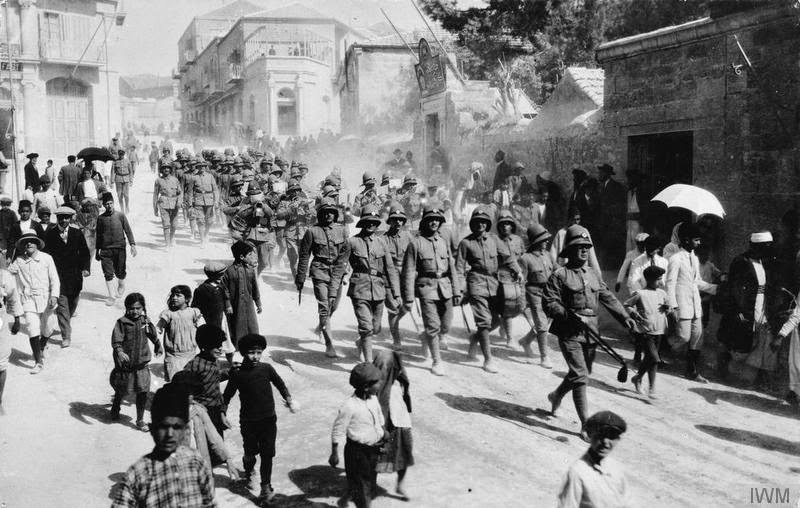 A parade of soldiers and a military band from the German army marching down the middle of Jerusalem broke the routine and brought Jerusalemites into the street, especially the young boys. 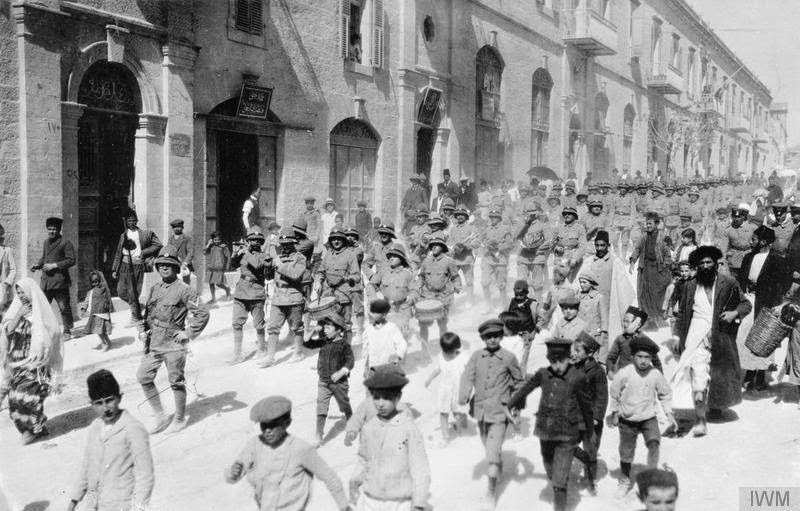 These soldiers were on their way to church services in the Old City on their holy day before Easter. German fife, drum and horns lead the soldiers to Good Friday prayers. Note the onlookers. The Germans were allies of the Turkish rulers of the land. They served as advisors, commanders, and pilots in the war against the British and their allies. These photos were taken by an "official German photographer" and were found in the archives of the British Imperial War Museum. Where was the picture taken in Jerusalem? Note the onlookers and the children, probably Jewish because of their caps. We invite our readers to study the photographs recently digitized by the Ottoman Imperial Archives. Exactly where did they take place? Photograph the modern-day location and send it to israel.dailypix@gmail.com. The second picture is outside Jaffa 17 (note the number ١٧ in Arabic numerals near the top left), along what is now the light-rail line outside the Municipality complex at Kikkar Safra. The same shop fronts, arched doorways and balconies are still visible in Google Street View, not much changed.